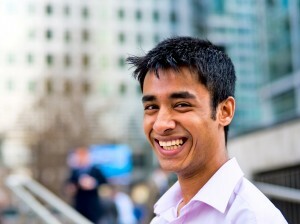 At the age of 13, Sabirul Islam, a young boy living in crime and violence-ridden East London, learned a valuable lesson. He was hired by his 14 year-old cousin, who had decided to start his own company designing calenders for teachers. Sabirul recalls: “I kind of took it for granted because he was my cousin and I thought that the money would just roll into my back pocket.” Two weeks later, he received an official letter from his cousin announcing him that the he had been fired. Being fired by “my own flesh and blood was the toughest thing to take.” It also opened Sabirul’s desire to become an entrepreneur, as he realized he did not want to work for somebody for the rest of his life and do whatever he would be told. So, at the age of 14, Sabirul decided to start his own website design business, called ‘Veyron Technology,’ which he ran for two years and provided him a healthy income, until web design business became a “very common” business venture. His company had several major clients, including Merrill Lynch, ABN Amro and Morgan Stanley and even won an award for “Best Inner East London Company”. When he was 16, Merrill Lynch provided him with an opportunity to learn the basics about investment and trade in New York City. Because of his wealth of knowledge and experience, the young entrepreneur started being approached by young people interested in learning how he had attained success at such a young age. Sabirul realized that he wanted “to educate entrepreneurs and help create a platform where they are able to grow in stature and develop their own brands. […] It’s my mission to inspire and create success for both today’s and tomorrow’s generations.” The young entrepreneur strongly believes that “what teenagers lack is the belief that they can be unique and extraordinary in life” and wanted to change that. His desire to impart his knowledge to other young people and help them achieve success determined Sabirul to write his first book, ‘The World at Your Feet,‘ when he was 17 years-old. His book launch allowed Sabirul to become a motivational speaker. In the first nine months following the launch, he shared his experience as a young entrepreneur at 379 events and sold over 42,500 copies of his book. Sabirul did not stop there. He created a new business called ‘The World at Your Feet’ after his first book, which comprises many small enterprises and programs that deliver inspiration, empowerment and entrepreneurial initiatives to youth across the world to open their gateway to success. For instance, one of the small enterprises Teen-Speakers is a speakers bureau made up of 25 UK and 25 International speakers with extraordinary success stories to inspire and empower young people, while Teen-Designers is a group of ten talented web designers willing to help young people design a website for any objective they have in mind. The unstoppable young man has also created a publishing agency for young people aged 5 to 25 to publish their books professionally and sold through online retail channels. He launched the Inspire1Million Campaign, during which he held motivational talks for one year in 20 countries all around the world, with the aim to inspire, engage and transform at least one million people. In February 2012, the young entrepreneur released his third book, entitled ‘Young Entrepreneur World,’ which contains interviews with 25 of the most successful entrepreneurs around the world, who share their journeys on a personal, business and political scale. For his great accomplishments, Sabirul has received numerous awards, including the 2012 Tower Hamlets Civic ‘Young Achievers Award,’ one of JCI 10 Outstanding Young Person’s the of World 2010 and the 2010 JA-YE Top 20 Young Entrepreneur.